The Blacklist returns after the Super Bowl on February 1st with a two-part episode that continues February 5th in The Blacklist’s new timeslot – Thursdays at 9pm on NBC. In advance of its return, OHSOGRAY participated on a call with executive producers Jon Bokenkamp and Megan Boone (aka Elizabeth Keen). Here’s what they had to say on what we can look forward to in the rest of season 2. Can you tell us about Ron Perlman’s character, Luther Braxton, who will be appearing in the two-part event? Jon Bokenkamp: Luther Braxton is a thief who goes about stealing things through incredibly complex methods. He sort of disguises his heist in big events. So there might be a massive snow storm or there might be a political uprising in some corner of the world where he’s looking for something. He’s constantly moving amid this sort of chaos and creating chaos wherever he goes. We thought that it was a great sort of big, fun character that would fit really well with the Super Bowl and be a little bit of a different sort of Blacklist-er in scope and size, and in terms of what he’s after and how important it is to Red. Megan Boone: I can speak from being on set with Ron Perlman. He brought that imposing presence and just this incredible voice; this deep, gravelly voice to the character. But then in some ways he really – he played a serene, calm that seemed almost creepy, like as if he were the eye of the storm. So it was really interesting to watch him come do his thing on our show. What are the circumstances in which he first appears? Jon Bokenkamp: He is a prisoner in a black site prison which supposedly does not exist and he’s sort of laying in wait when the episode opens. Yet he’s sort of pulled away in an interrogation facility that nobody is supposed to be able to escape from; however, things go awry. Elizabeth Keen has been darker this season. Have you been surprised by that? Did the producers have this all planned out, or is this something that’s just coming as the scripts move along? Megan Boone: Yes, I certainly have had a reaction to it, but it wasn’t a surprise. I was delighted and intrigued by the new direction, as well as sort of anticipated it as it was coming because there was no way, especially with Liz being sort of the protagonist in the sense that Red is a catalyst for her change. There was no way that she could stagnate and stay where she was, especially with all that was happening with her. Her evolution was essential to the show’s growth. I was definitely glad to see that start to happen toward the end of Season 1, and really intensely into Season 2. Jon Bokenkamp: Yes, I think that’s right. It’s definitely something that was baked into the cake of the series. In Season 1, Elizabeth Keen is somebody that we meet who is very new; first day on the job. But she has this very sort of idyllic life – the house and the husband and the dog and all of that. By the end of the first season it, it’s completely ripped away from her and she’s in a place in the second season now, where she’s sort of having to confront the question of: ‘Who am I? Everything I believed I knew about myself; the whole world that I’ve sort of created around me is now gone.’ Looking ahead, now having Red be in her life and sort of influencing the way that she thinks and reacts, has certainly shaped the direction of the character. I think that’s one of the big questions about the second season is sort of how far is she willing to go? How dark is the character willing to go, and can she sort of hold on to a bit of light rather than completely going down the rabbit hole. How is it working with James Spader, both as an actor and also from the production side, knowing that you can do so many things with him? Jon Bokenkamp: Yes, I mean look, James has – always has great ideas. He’s incredibly intuitive. He has a great sense of the character. He’s an incredible collaborator. Megan, you have far more experience with sort of on set and in the day-to-day grind of that. I look at him more from a sort of story perspective but, maybe you can speak to that. Megan Boone: James is definitely the master of the ship over here and this is not his first rodeo as they say down South where I’m from. That’s just an example, particularly of how different he and I are and why this is working so well. He’s from Boston and I’m from rural Central Florida. His parents were professors and mine dealt in real estate. We come from different sides of the earth — not literally — but figuratively, and it’s just sort of interesting to put the two of us together and see what happens. He’s has 30 years’ experience in the business, one successful television show, and this is essentially my first go at it. So it’s been invaluable having him here to help acclimate me to this new environment and this new task at hand. I feel that we’ve been extraordinarily successful beyond my wildest dreams. I definitely think that it’s his wisdom and experience that has helped me to rise to that occasion. Megan Boone: Yes, but on the surface, certainly out relationship is sort of mentor/mentee dynamic. But I think that once you get into this – the complexity of the dynamic starts to get much richer. I think James and I are really starting to just work as peers and work together and influence one another. I would hate to think that I come to work and don’t have an effect on the people around me in any way just because this is my first show. And I think I do. So it’s become a very important relationship. And so certainly in my life – and I would hope in both of our lives. Were you excited to score the spot after the Super Bowl? Jon Bokenkamp: It’s a huge opportunity. It’s a lot of potential new eyeballs watching the show. I suppose on one hand that can be intimidating. I think we see it as a great opportunity to let people see what the show is. I also think that the episode, it’s a two-parter but it is – it’s a very easy access point. I think somebody who’s never seen the show before will be able to drop in very quickly and get a real sense of what the show is; how it feels, smells, tastes; all of that. As much as we do have some sort of serialized elements, I think that’s one of the most exciting things about it, but it’s also a huge vote of confidence from the network. And it’s just a – it’s incredibly flitting, quite frankly. Megan Boone: The really fun thing about it happening is that I think that Jon Bokenkamp and his team of writers have really started to understand what is – what works with the show and has started to have a lot of fun with that. Not just what works with the actors on the show and our dynamics but also what are the elements of the show that are indispensable. Like what kind of villains do you want to write that really work for the show? What is the format? These things started to really coalesce in Season 1. And as they say, we really grow a beard. Now I think that the fact that we’re getting this opportunity to show – to sort of showcase the show to a larger audience is just really exciting at this time in our creative process. Do you think that a character like Cooper could ever sort of give it all up and let it go? What’s Harry Lennix like to work with? Jon Bokenkamp: I don’t know that Harold Cooper could give it all up. I would say that there are a lot questions in his storyline. As we move forward, we were introduced in first episode of this season, to the idea that Red knew of some sort of diagnosis that he had been given. So there’s something brewing there that Cooper has certainly not let anybody in on, and I think that’s going to come to the surface quite quickly. David Strathairn, Janel Maloney, and Gloria Reuben will be guest staring in the first couple of episodes. What are they doing and who are some of the other guests we can expect as the season continues? Jon Bokenkamp: Yes, [Gloria’s] great. I just saw the cut two days ago for the first time, and it’s great. It’s really going to be a great episode. Yes, Gloria is incredible in the show. David Strathairn and Janel…they enter the story in a rather sort of cloak and dagger sort of way. David Strathairn plays a character known as the Director who in real life, the Director of the National Clandestine Services’ identity, as least to the general public is not known. That is who he plays and he – I suppose may raise a couple of questions. With him and most of the cast, the thing is always interesting to me is the people. As far as guest stars, one of the most exciting things about the show is to be able to sort of dream up a character and you start kind of hearing a voice or thinking about who might be fun to play. It always blows my mind the sort of – the variety and the caliber of actors we’re able to work with. It really makes the job a blast. These guys are certainly no exception to that. Do James Spader or Megan Boone or any of the other actors change the way you write for their characters? Jon Bokenkamp: Yes, absolutely. One of the things that Megan had mentioned before, in terms of the show starting to kind of find its footing and what it is, is in part to that. I speak to them. Any time there’s sort of a concern or something feels wrong, I mean Megan will give me a call and say look, I just don’t – you know Episode 210 that we were just talking about, she called and said, ‘Look, I think this isn’t quite right here.’ We’re always open to that and we’re always collaborating as much as we can. But I also think – John Eisendrath has said — he’s not on the call at the moment, he sort of has said, and I’m starting to think this is true, that at a certain point in the television show, the more you get to know the character and the more you get to know the people playing the character, the line between them becomes a little more blurred as time goes on. I do think that whether it’s something that you just know like would be natural, as far as the language, or something that’s a real strength in terms of what that performer is able to do, you start writing that and I think they start feeling more comfortable for it. So yes, it absolutely does – the actors themselves certainly do influence the characters to an extent. It’s part of the collaboration. Have you always had ending in mind or has that changed since the first season? Jon Bokenkamp:	Well yes, there is certainly an ending in mind – one that we’re constantly writing to and around. At times, it makes it quite difficult because it sort of restrains us in the stories that we’re telling in some ways. But I think it’s also working that way – whether that’s the end we arrive at or not. Whether anybody lets us do what I have in mind and what we talk about so often in the writer’s room, it does shape the show and it helps – it’s like building a house. You know what furniture you like. You know what kind of architecture you like and then you kind of feel what doesn’t fit; what doesn’t belong. By process of elimination, it sort of starts feeling like its own special thing. I think that’s helped influence the show. That said, we always have ideas and things that we think we’re going to land at. Sometimes we get to them sooner. Sometimes we take a different path. It’s a little like knowing our destination and having looked at a map a couple of times and then throwing out the map and sort of using our gut to get there. So it’s quite a process, but we do have a strong sense of direction; yes. When we last left the Blacklist there was a bit of a moment there between Tom and Red. Will we get more information on this in the first two new episodes? Jon Bokenkamp: It’s definitely something we’re exploring in the back half of the season. We don’t dive right into it in the Super Bowl episode. The Super Bowl two-parter is – I like to think of it was sort of an event movie. It’s large in scope and if it had a movie poster it would be the summer action movie. Because of that, the timeframe is very compressed and it all happens almost in real time as you’re watching the episode. There is no time to drift away and see that story of Tom. However, Tom and Red; the nature of their relationship and what Elizabeth Keen does or does not know or is in the process of discovering about that relationship, is certainly something that we’re going leaning into in the back half of the season there. With Liz and Tom how they left things, is Liz still conflicted about what’s going on and what her feelings are with him, because she let him go? Jon Bokenkamp: She did let him go. Megan Boone: Strangely enough I think Jon and I might have different opinions on this one. I want to hear Jon’s. I think that it’s an oversimplification to say that she’s in love with him, as has been implicated by some of the other characters like Red and Ressler. I think she’s got really strong feelings for him, but it’s a very complicated dynamic at this point. I think once a relationship goes past the line and becomes abusive or sadistic in any way, there’s just no going back to pure true love. There just isn’t. It already has violence in it. It already has mistrust. So I always felt like it was just an oversimplification to say oh, she still loves him, you know? Jon Bokenkamp:	Oh you’re madly in love with him. No, I think – look I work with a bunch of writers who are strange and dark and have very complex lives. I think that – yes, it might – it is – I think Megan’s right. I think it’s probably an oversimplification to say that yes, she’s in love with Tom. I do think that – I feel this way about the show in general, that everything is much more complex than it appears on the show because whether it’s the suburban housewife dropping her kids off at school, or it’s the guy showing up to punch the clock to work at the steel factory, I don’t think any of those people are really quite what they appear to be on the surface. I think you never say never. Anything can change. So that doesn’t mean that’s where that relationship is going, but I do think that like any breakup; like any sort of marriage that falls apart, it’s messy and the feelings I think are really — and by the way, this is speaking from somebody who’s never gone through a divorce — but I think, what I’ve heard, is it is incredibly complex. And that feelings and emotions sometimes people who do things that is not, in their best interest. Sometimes logic does not prevail. I think the best answer I could give to that is that I think it’s incredibly complex, and that I would say that the story of the two of them, whether it’s a love story or not, is not over. There’s still a lot of mileage in that story. Megan Boone: See, we didn’t disagree. We didn’t disagree at all. We completely agree. Jon Bokenkamp:	We didn’t? Did we find a middle ground? Megan Boone: No, I think we actually completely…agree. We just – we haven’t had a really open discussion about this recently because Tom’s been kind of like on the back burner while we Super Bowl it. But I think that we have – that’s what makes me excited about being on this show is that we have writes who believe that about the mom dropping the kid off at the carpool line, that there’s always this very much more layered psyche than you would first, initially assume to be there. So it’s just exciting. Also the fact that he has a bunch of freaks and weirdoes writing for him is cool. Chemistry is a word that we use a lot and often over-use it, but your relationship on screen with your cast mates is really pretty special. Megan, to what do you attribute that? Megan Boone: Well I think that I work differently with each actor based on who they are as an individual. That’s something that I think seeds a relationship on screen. I’ve also worked really hard to develop skills of listening and presence that really can stoke the fire of a relationship on screen. And I love them. I mean I’ve grown to really love them all. I don’t know how they did it but they managed to cast an entire ensemble of actors who are all actually really wonderful, lovely people. And thank god, because this is such an ambitious production that we’re really – we’re really in the trenches together on this show. And you just build a bond, and we have. I’d say, all those things combined, that’s my responsibility. I think that they also bring their own special something to the screen that adds to that chemistry. And that can only be credited to the casting of the show which is obviously really superior to a lot of productions. The actors that come on the show are incredible. Megan Boone: Well I have more experience than most of the actors in the world, now that I’ve done this show. If I like could count up all the hours I’ve acted over the last two years, it’s probably more than 99% of working actors have in a lifetime. Jon Bokenkamp: It is. Megan is in like – it’s weird when we go back and look at it, Megan is in damn near every scene. You go through and look at the show, it is pretty impressive. How have you reacted to the praise you receive for your portrayal of Elizabeth? Megan Boone: Well I – this makes me strangely uncomfortable to answer. For me working with the pedigree of actors that have come on the show has eliminated how human everyone really is. And it’s sort of – it sort of took away the mystique that I had around legendary or award-winning or whatever title you can put on any actor. Because what you’re really doing when you do that is you relegate them to a holiday. Like Monday – this next Monday is Martin Luther King Day and what we’re learning from Selma… now is that’s really a relegation of who the man really was. When I meet these great actors and they come and then I get to know them and now dynamic they are as people, I realize that they’re even more than I’d ever anticipated and much less intimidating. So that will serve me really well in the future if I ever act opposite a Meryl Streep or a DeNiro or somebody whose films I basically grew up on. As far as the reviews, I’ve learned to stay away from reading anything about myself, mostly because actually the truth is, is that the media is really harsh on women for the most part. And I found it to be really hurtful. I think that one of the blessings that I have for my work is that I’m extraordinarily sensitive. But it became an extreme curse once I was on the world stage and I had to learn how to manage that. The best way to manage it for me was to never read anything on the Internet. Never read anything about the show. Megan, what’s the most fun or challenging part about playing Elizabeth Keen? 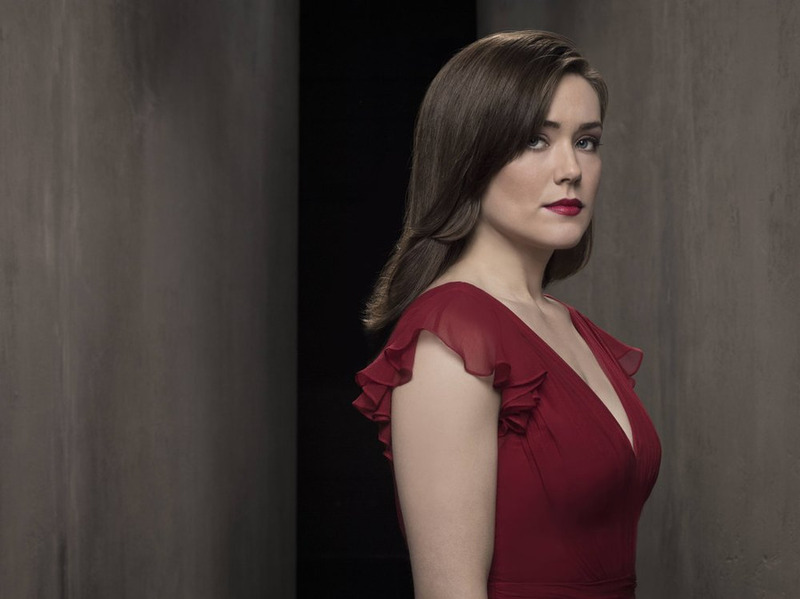 Megan Boone: I think it’s how different she is from myself. I’m a real pacifist. I could show you guys a picture – in fact I’ll post it today on my Twitter, of me initially holding a gun, right before I was cast for the role. It’s pretty funny. I’ve had to develop a part of myself that was not even there. People say oh, you’re such a tough girl. You’re so badass or whatever – however they label her. It’s like no, I’m not at all. That’s the most fun for me is having to step up and adopt that kind of personality. There was a moment early in the season where Elizabeth kind of had to admit to herself that she relies on Red now to be there for her. What kind of development are we going to see in this still ambiguous father-daughter relationship? Megan Boone: I think that’s a Jon question. Jon Bokenkamp: Well yes, I mean I think it’s — how do I answer that? I think that is the tightrope that Liz is walking. Red clearly has an agenda of his own. He almost always does. And there are clearly things he’s withholding from her. We don’t know if that’s for good or bad reasons, and I think the extent to which she trusts him; the extent to which she becomes like him is sort of the territory that we’re in right now. And that’s sort of I think, the larger question and the thing that Liz is probably struggling with is you know, what is the best way to handle this situation? What is the best way to confront this person or solve this crime? Is it the by-the-book way which she was taught at Quantico, or is there another side of the coin that perhaps is just as good, if not better? So I think the dynamic there is sort of the reflection in herself that she might – and so the reflection of him in herself she might see. And whether that’s good or bad I think is a very – again, a very messy sort of complex journey that’s she’s on. Things become heightened I think, in the back half of the season. And certainly with the Super Bowl episode, the dynamic of what’s happening just plot wise within the series, sort of ratchets up. And so that also is going to sort of put everything under a bit more of a microscope. But I do think the fine line that Liz is walking and the sort of guidance that Red is trying to give her is — and whether that’s good or bad advice that he’s giving — is sort of the crux of where we are right now. Will we learn more about their pasts this season? We got quite a bit of that last season, but are we going to see more before the end of this one? Jon Bokenkamp: We do, yes. We certainly do even in this two-parter coming up. You know we dip back into the past and we answer some questions about how they’re connected. You know it’s interesting to me how I hear a lot that we’re spinning a lot of plays on the show and there are a lot of unanswered question. But we sometimes answer big ones. And it feels like because it’s an answer it raises more questions. I think that’s the nature of the beast. But like with Tom knowing Red, we learned at the end of our fall cliffhanger that Tom and Red know each other and that there’s some sort of relationship that Liz doesn’t know about which to me I think is a huge answer. That is confirmation of something that we’ve been wondering about – or maybe not wondering about. But it certainly is a big, new clue. It’s interesting to me how that yet raises another question. So yes, we will absolutely be getting some concrete answers about their relationship. Perhaps not the entire picture, but absolutely a more clarification and more coloring on the relationship. [VIDEO] Sneak Peek: New VIKINGS Season 3 Preview!